There are a number of training opportunities available through the Family Centred Practices Group. For families participating in our Behavioural Intervention Program, a 2-day training workshop is required for all Behavioural Interventionists working on the team. In addition to this, individualized, on-going training and support is provided to all team members. The Behavioural Parenting Workshop Series provides family-focused information pertaining to varying needs of the child. 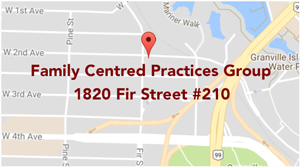 Behavioural Interventionists and other service providers may further their knowledge by participating in upcoming workshops offered by the Family Centred Practices Group and/or the Behavioural Interventionist Training Partnership. Please view the links on the right hand side of this page for more information on the various training/workshop opportunities available. This three-part workshop will not only provide you with a better understanding of why your child engages in challenging behaviour, but also strategies to address and effectively manage the behaviuor. It is suitable for parents whose challenges occur in home-based or community-based routines (eg. getting your child ready for bed, sitting down for a meal with the family). The last day of the workshop is dedicated to reviewing the experiences you had upon implementing the Support Plan you created. At this workshop you will receive a workbook, watch videos demonstrating various strategies and be given an opportunity to practice what you have learned.